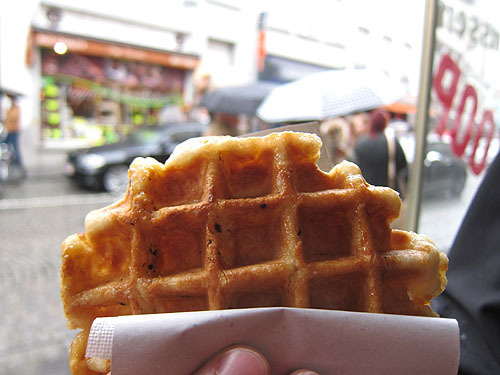 not martha — Eat a Liege style waffle in Belgium: Check. 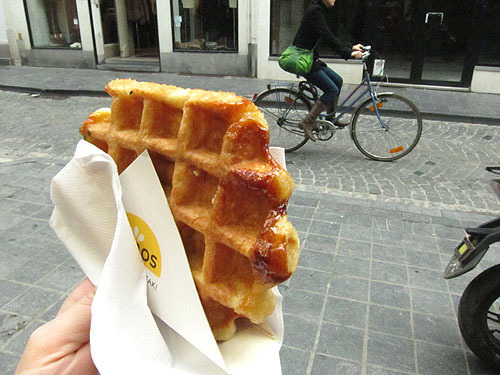 Eat a Liege style waffle in Belgium: Check. Last weekend I checked off an item on my life list and the first of four things I’m hoping to do while on my trip to the UK. 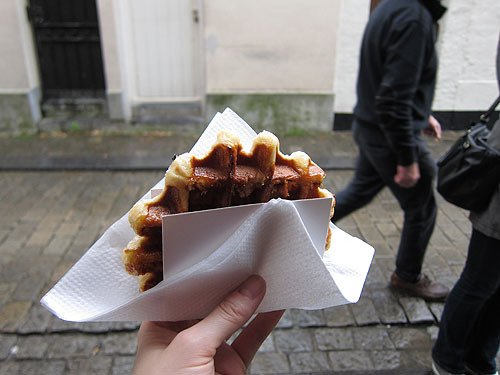 I ate a Liege style waffle while standing firmly on Belgium soil. While standing in Bruges to be exact. We found the first one within less than an hour of arriving in the city. It was delicious. Warm and yeasty and sweet and the perfect way to shake off the the slight panic brought on by finding all the train station listings in Belgium to be in Dutch and therefore completely incomprehensible to us and being without a SIM card for Belgium. Oh the horror. The next day we set out to find more and, delightfully, it wasn’t difficult. I’m including the time stamps below so you can see how easy it is to stumble from one waffle place to the next. 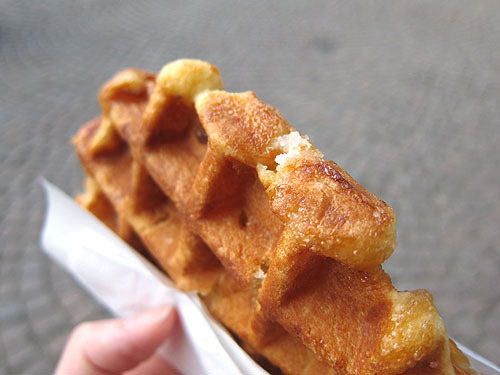 In all of these we bought the hot waffles from the window of a shop and ate them while wandering around. And after that we really needed to stop and go find some salad for dinner. The next morning we had a waffle from this adorable van. We ate it while standing in a park and looking at a Medieval cathedral. Bruges I love you. I love following all of your adventures! We’re planning on going abroad and was wondering what you did so you could use your cellphones without it costing a fortune? Thanks! In our case we have AT&T iPhones so we requested an unlock from the AT&T site, followed the directions and got a confirmation of them being unlocked after backup through iTunes. You do have to own your AT&T iPhone for a set amount of time — in our case it was two years — before it’s eligible for unlocking. Our SIM cards weren’t for use in Belgium so we relied on wi-fi at the hotel and Offmaps (I paid the $8 for unlimited map downloads and it’s been more than worth it on this trip). Don’t forget to bring a paperclip to pop the SIM out of your phone — I did forget a paperclip and we relied on the kind people at a convenience store in the airport who have encountered their share of foreigners like us who just need a little pokey thing and lent us a tool to do the job. If you are unable to unlock your phones look into what your plan offers for foreign use. Last time I was in the UK my phone wasn’t able to be unlocked so I bought a month of data from AT&T (not voice, not SMS, just data) and used it sparingly (maps!) and it was all I needed. I waited until I was in a wi-fi area to check email and social media and upload photos. Be aware though that a month of data might overlap the month of your trip in an inconvenient way — in my case my month of data didn’t kick in until the third day of my trip so I was willing to pay a few bucks to use Google maps to get our car pointed in the right direction. To avoid accidentally using data go into your settings and turn off Data Roaming (and leave it turned off for the whole trip), and when you don’t have a SIM for overseas use turn off Cellular. Please feel free to email me if you have more questions! I have never wanted a waffle so bad before in my life… They have been a major pregnancy craving recently and this just made it worse! 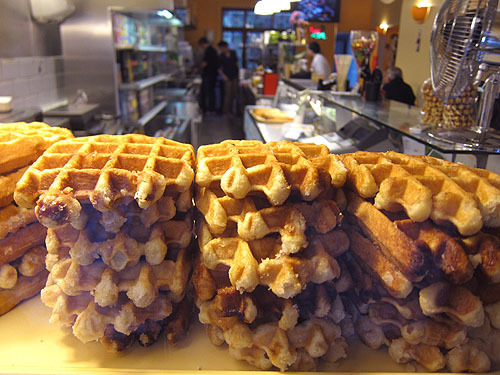 I lived in Belgium on exchange as a teenager and the complete abundance of waffles was amazing. 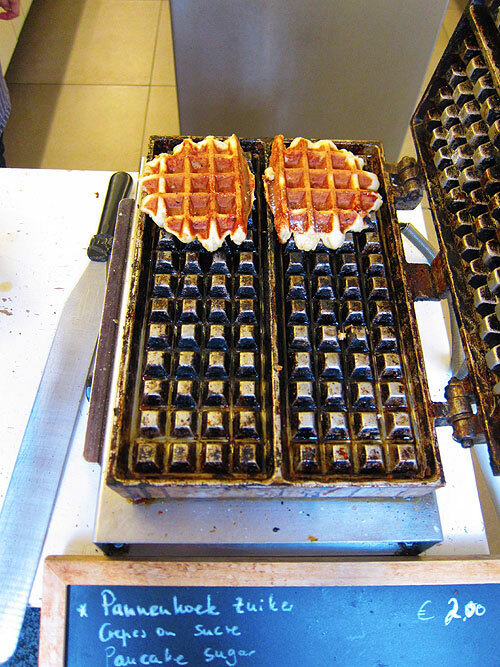 They have as many waffle stands as we (in Canada) have Tim Hortons’. 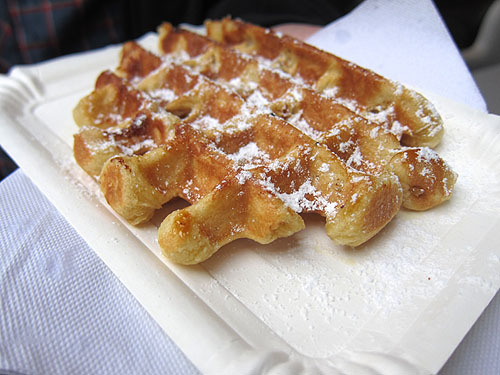 They are so good, with the crispy sugar and powdered sugar and warm goodness….mmmm. I’m glad you ate (or at least shared) so many waffles in one day. My record was 4 on a trip to Brussels, but it was so worth it! Oh, the suffering that you are forced to endure in the name of research on our behalf!! But you seem to be soldiering through it all right. I hope you found out where to get that massive waffle iron in the 6:45 picture and are bringing it home! I need to get me one of those. It would really speed up making breakfast – no more “That’s mine – the next one’s yours” carry-on to listen to. Plus the waffle cook would get to eat with everyone else! Thanks so much for the update Megan! We’re not leaving until next fall, but thanks on your speediness. I have a Droid rather than an iPhone, but I’m guessing it would be a similar process. Thanks again! I’m so happy you found the waffle of your dreams. 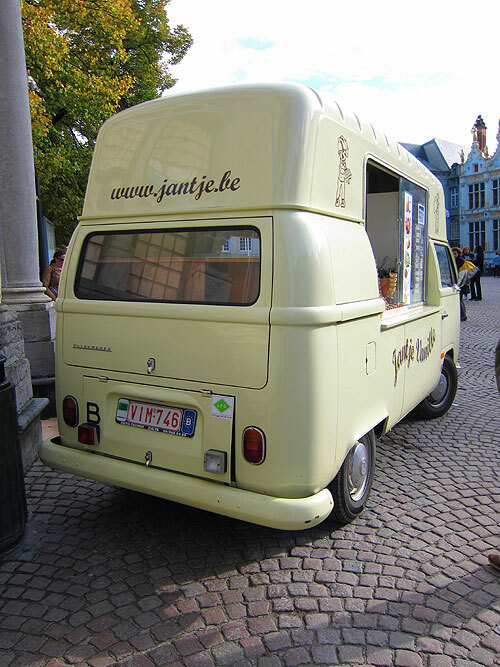 Next stop – Frites! Thanks very much for the SIM information. I wonder if it works in France. Oh, man – everything about this is enviable. Those waffles look SO good! Stop, you’re KILLING me, Smalls! This looks so delicious, it hurts. How much do I love that you ate THAT many waffles in a day!? 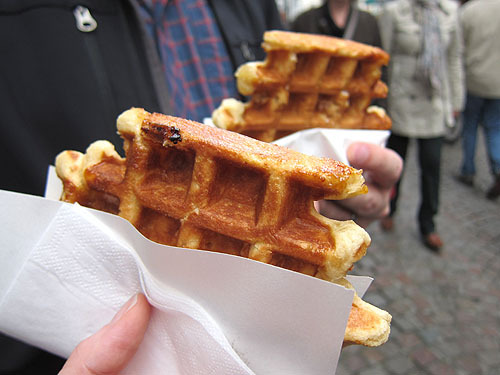 We went to Bruges last year and it is one of my favorite places evarr. We were more into the beer and (slowly) drank every night and day we were there and wandered around the cobbled streets. We were time-crunched on our last day there to check waffles off our list and had a REALLY hard time finding one before 11am.